Co-Optimus - News - Farming Simulator 2013 Launch Trailer for Expansion Pack "Titanium"
Jump a blazing monster truck off of Mount Rushmore FOR AMERICA!! Slap on your overalls and your American Flag do-rag and get ready for Titanium, the new expansion out now for Farming Simulator 2013. You and whatever poor sap you tricked into being your farm hand can hop onto even more vehicles and harvest wheat like never before! Or exactly like before. I'm not a farmer. I don't know where food comes from. 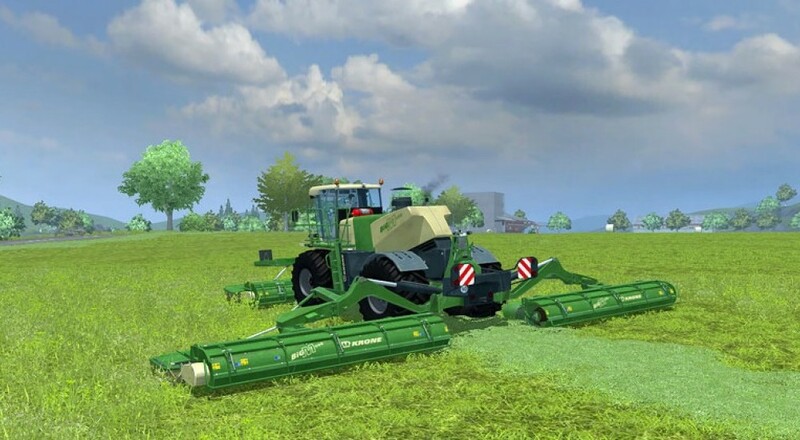 Up to 10 players can tackle a variety of farm chores in a game, in case you've somehow convinced nine of your closest friends that driving virtual tractors and planting fake asparagus seems like fun. In addition to the previous location sets, Titanium allows farmer wannabes to tend plots in the Land of the Free. That's right! You are no longer bound by the strict agrarian laws they face in Europe. (What do they even grow over there? Princes?) In addition to your all-American produce, you can also tend to chickens, cows, and sheep. In a noble attempt at authenticity, Titanium has licensed over 20 real life manufacturers of farming equipment to appear in game. Now, once again, I'm not a farmer. But it seems like the only people that would get really excited about real companies being in game WOULD be farmers. But... Would farmers want to play a video game about farming? Why would you want to drive a simulation tractor when you could just jump into the driver's seat and spin brodies in a real one? Maybe this product is strictly intended for the masses of farming enthusiasts begging for the most life-like farming experience money can buy.